With the race about to start, here is another excerpt from my “2013 Kona Rating Report” with my odds for Kona. Even though I have written this article a few weeks ago, not too many things have changed. 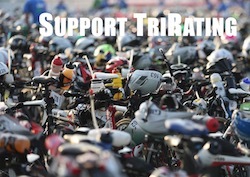 To check out how they hold up on race day, please check out my “Live Predictions” at kona.trirating.com. As usual, it is hard to pick a clear favorite. Last year’s winner Pete Jacobs knows how to be in top shape for October, but as usual he has been laying low for the season. Craig Alexander has also not had a stellar result in this season, but I’m sure he would love to go out with a bang. After these two, Andreas Raelert has qualified with a sub-8h time in Austria – but the time for his first Kona win is slowly running out. Eneko Llanos has had a great season so far, but has struggled to race well in Kona. Macca is an experienced competitor, but he hasn’t had a good Ironman result since winning in 2011. There are also a couple of long shots: Dirk Bockel has posted a number of strong results in Kona and has been focusing on this race for a while. Last year’s third placed Frederik Van Lierde produced a strong result in France, but does he have the potential to step it up? James Cunnama may have the potential to win Kona, but he probably will need a bit more experience to be able to produce a great Kona result. On the women’s side, I see four athletes who are a bit ahead of the rest: Caroline Steffen (good, but not stellar season with a lot of racing), Mirinda Carfrae (took care of validating early and has been laying low since then), defending champion Leanda Cave (also validated early, but has been dealing with an injury) and Rachel Joyce (good qualifying race in Texas, and hopefully took her usual “Kona infection” in the summer to allow for a decent Kona prep). The numbers are so close together that it’s almost impossible to objectively pick a race favorite. After these four, I decided to skip the “In the Mix” section and go straight to the “Long Shots”. Yvonne has had a great season so far, but other than a second place from 2008 she hasn’t had a good result in Kona. Jodie Swallow has only started IM racing this year, and she’s been always on the podium and steadily improved her times and pacing. But there haven’t been too many Kona rookies to win the race. Then there is Mary Beth Ellis – unbeaten outside of Kona. Maybe she’s ready to pull off a great Kona performance this year. Although there are only three spots available, I have four “safe bets” for the podium. Obviously, at least one won’t be able to make it – but it’s hard to pick which one is not. Andreas and Pete have been super-solid in Kona. Eneko was great this year, and Crowie was only once off the podium. Behind these, there are a few established “aging” athletes (Macca, Timo), a few solid racers still working to improve in Kona (Frederik, Dirk, Jordan, David, TO, Sebi) and a few that are either in Kona for the first time or still working to find a good Kona result (James, Ronnie, Bevan). For the girls, the best three picks are pretty obvious: Xena, Leanda and Rinnie. Next we have Yvonne with her long list of good results. The TOP3 odds for Rachel are almost the same as her winning chances – which means that statistically she either has a very good day and delivers a winning performance or she is “completely off” and either DNFs or finishes pretty far down the list. Mary Beth also has had some TOP3 worthy results, but she hasn’t had a Kona-winning worthy performance yet. Behind these, the odds drop pretty quickly, a lot of athletes that we have seen winning races in the season only have a very small statistical chance of a podium finish. However, we usually see at least one “break-through” performance in Kona – and it’ll be very interesting to see who will be that this year.